In 2010, Equity Bank called in MSC to help with their digital transformation. 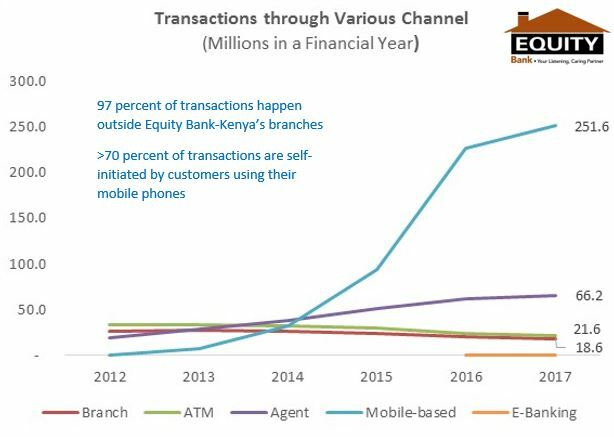 Today more than 97% of Equity Bank’s transactions in Kenya are conducted outside their branch network, and more than 70% are self-initiated by their clients on mobile phones. Can you imagine what that does to their cost structures? The International Finance Corporation (IFC) calculates that it reduces the annual cost to serve a customer by 80% – one reason why the business case for digital transformation is compelling. As financial services providers increasingly embrace this transformation, we are at a watershed moment for financial, and indeed social, inclusion. The digital revolution is already underway, and our decisions now will determine whether we create a digital divide between the more affluent and the poor – or whether we create truly inclusive economies and societies. Technology presents the financial services sector with four huge opportunities – and also three significant threats. McKinsey estimates that digital transformation of financial institutions could add 45% to their annual net revenues: 15% from enhanced product uptake, and 30% from reduced operational costs. Equity Bank in Kenya has demonstrated how full digital transformation can radically change a bank, and as user-initiated transactions climb further, we can expect its operational costs to reduce still further. But it was not easy or cheap to do this. MicroSave worked alongside the bank from 2010 to help develop the strategy, refine the products, build the agent network management system, think through marketing and communication, and coordinate the change management process. Eight years later, the bank is completely transformed. It is truly a digital bank now – efficient, customer-responsive and flexible enough to respond to individual customers’ needs. Traditional microfinance institutions (MFIs) and banks have important competitive advantages over fintechs. They have valued, historical relationships with millions of customers; they have data on those customers’ financial behaviour; they have the infrastructure to provide the human touch that low-income customers crave. Furthermore, traditional financial institutions have the right regulatory clearances and compliance to offer financial services – something that fintechs often lack. Traditional financial institutions need to be cognizant of the changing demographic and cultural context – namely, the rise of millennials and the mobile-first generation – to develop and deliver a first-class, personalized user experience. A great user experience involves solutions and delivery channels that mimic the behaviours and attitudes – the mental models – of the customers. This can significantly reduce the client churn that MFIs routinely face. Looking into the medium term, the tech revolution allows us to answer the elephant-in-the-room question: “Financial inclusion for what?” Tech allows us to link pure financial services to the real-world economy. For example, MicroSave is working to develop “precision agriculture” in India by linking farming with finance. Under this project, data is collected on a farmer’s land holding and soil quality; as well as the seeds, fertilisers and pesticides he or she has purchased. This allows AI-powered chat bots to provide tailored coaching to optimise both yields and the prices the farmer gets in the market. Many MFIs are still using the basic model of group lending, in an age when agile fintechs are offering individually tailored products, delivered more quickly and conveniently. At best, most MFIs are digitising their disbursement and collections processes and using or establishing mobile money agent networks to recover their loans. I am afraid that this is not enough. On the horizon, and entering MFIs’ markets, are a wide array of fintechs offering personalised services, and flexible financial tools that reflect low- and middle-income consumers’ mental models and money management strategies. These fintechs manage their credit risk using sophisticated data analytics, and are often backed by deep pockets in Silicon Valley and elsewhere. Also, we should not forget the super platforms such as AliPay and Amazon that are gradually expanding their reach, and have nearly unparalleled data and financial resources at their disposal. Two years ago in Luxembourg at the European Microfinance Week conference debate, I cited newspaper articles saying 400,000 people were negatively listed (i.e. identified as credit risks) in Kenya. MicroSave worked with one of the country’s Credit Reference Bureaus to analyse the problem. In March 2017 we found that there were 2.7 million people negatively list for unpaid digital credit loans, of which 1 million had defaulted on loans of less than $10. By May 2018, 3.6 million people – 13% of the adult population of Kenya – were negatively listed. So, the digital credit revolution sweeping Africa is clearly reducing credit discipline. But it is also increasingly serving small businesses, and offering the flexibility that clients crave and are unable to get from traditional MFIs and banks. About a third of digital credit loans in Kenya are now used for business purposes, according to the recent CGAP telephonic survey. Furthermore, a growing number of digital credit providers are reducing the interest rates on loans to high-performing customers with a good track record. In addition to this, there are a growing number of specialised digital lenders focused on using MSMEs’ data, other proxy indicators captured from the mobile phone, and psychometric assessments to make loans. These digital credit loans are easy to access, quickly processed and easy to repay using mobile money. As one digital credit borrower said to me, “Why would I go back to my MFI when I can get a loan at any time in 5 minutes? And I can pay using my phone from my business whenever I want, instead of attending endless long group meetings.” We safely assume that many MFI customers are thinking the same way – or looking at peers who have made the move to digital credit providers. There is a clear and present threat of a yawning digital divide – and with it the demise of many MFIs unwilling, or unable, to make the transformation to operate in the digital world. Fintechs are building their customer base in urban and peri-urban areas with the connectivity, the smartphones and the ability to buy data packages. They are serving the high-value customers. Thus, MFIs will be left trying to serve rural communities with poor connectivity, no smartphones, and not enough money for data packages – the low-value customers. This means that MFIs will not be able to cross-subsidise services to their rural, lower-value customers with the profits from services to their urban, higher-value customers. And fintechs will not be able to reach rural customers without access to 3G data services and smartphones – even if they were interested in doing so. This could spell the demise of financial services for the rural poor, because the business case is so difficult –particularly compared to the diverse, low-cost opportunities to serve the higher-value, connected urban market. In short, this could end years of progress towards financial and social inclusion. MFIs face an existential threat from digital technology. This is because fintechs are disrupting traditional financial services markets. So MFIs must embrace digital transformation. They must harness the potential of their legacy of experience and relationships. They must work with fintechs to deliver personalised, digitally-enabled services. And they must work through staff and agents to provide the human touch and assistance that so many still seek. The digital revolution offers us the chance to deliver rapid, responsive and differentiated financial and social services to low-income people in a way that we have never been able to do in the past. We can empower them to manage their household finances in line with their mental models for money management. We can empower them to set their own savings goals, to choose their own loan and insurance packages tailored to their specific needs, and to buy or use assets on a pay-as-you-go basis. And perhaps most importantly, we can use the digital revolution to support their farms or businesses with two-way flows of specific advice to optimise their returns. The digital age is upon us, the train is in the station, the ticket is not cheap or easy, the journey will be exciting and the final destination is still unknown. But not boarding the train would be a profound strategic error.